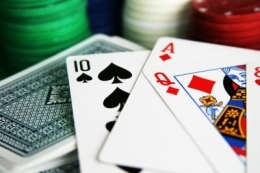 Blackjack hands can be of 3 types and each type presumes its own strategy to use by a player if s/he wants to improve the chances for winning or decreasing the house edge. According to blackjack rules, a hard hand is every blackjack hand of 2 initial cards which does not have an Ace or where an Ave can not be counted as 11 without busting. What to do if you have got a hard hand? Experts do not forget about blackjack players, and they had developed a special strategy to use and feel confident at blackjack table. Hard hands can be of 7 different types (depending on how many points you get out of your two initial cards). If you have hard 8 or below - do not be afraid to hit! Such a hand will never bust because it is impossible to get 13 points from only 1 additional card. If you have hard 9 - double if a dealer has 3-6! You have big chances to win here! If you have hard 10 - double if a dealer has 2-9. Otherwise - hit! Your ten points make you be sure that you will not bust after getting one more card because 11 will be maximum you can get. If you have hard 11 - double if a dealer has 2-10. Otherwise - hit! If you have hard 12 - stand if a dealer has 4-6. Otherwise - hit! If you have hard 13-16 - stand if a dealer has 2-6. Otherwise - hit! If you have hard 17-19 - stand! Always stand!!! These hands give very big chances for busting if you ask for one additional card; so, it would be better not to risk here. Want to know how to split blackjack hands? Look here.